SPARKS AMERICA CAMPGROUND-Jeff Bruton, pastor of Forest Church near Chandler, got his first taste of what goes on during “Bike Week Oklahoma” in this campground located about a dozen miles southeast of Chandler, June 15-24. 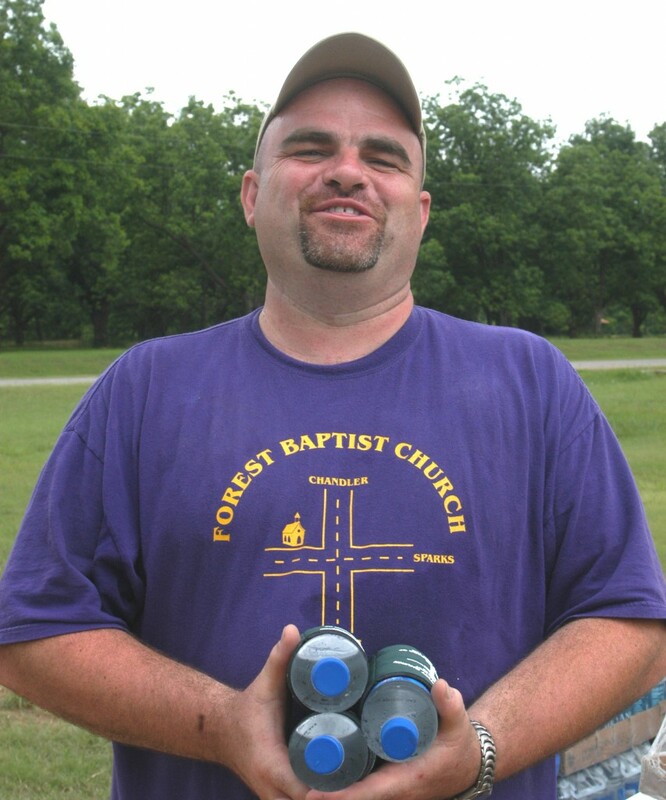 For four years, members of Forest Church have ministered to the thousands of bikers who converge on the 160-acre site by handing out cold bottles of water in Jesus’ name. This year was no different; however, they were joined in the effort this time around by Baptist General Convention of Oklahoma crisis response chaplains. The group distributed bottles of cold water nested in koozies with the church’s name printed on them and more than 1,000 “dew rags” sewn by Campers on Mission volunteers. BGCO chaplaincy specialist Paul Bettis, whose office is supported by the Cooperative Program, dispatched chaplains to the site this year. While the Sparks America rally is actually not a “crisis” situation, per se, it demonstrates how much many of the bikers live their lives in almost a daily crisis of sorts. Don Hunter, who led the team of chaplains, and Bruton walked the grounds of the rally June 18, along with Bettis. Bruton said what goes on during the rally wasn’t as bad as he had been told beforehand. Still, the bikers, who come to the 10-day annual rally to “play games,” drink beer and renew old friendships are a far cry from your usual church-going crowd; and for many, they had a good reason. One example was a young lady who was working the gate. She had recently been released from prison, Hunter said, and commented that she is very reluctant to go to church because of how she is treated there. Forest church is battling that perception as best it can. For the second year in a row, the church conducted a revival during the rally. Initial services were well attended, Bruton said, although no decisions had been recorded. The pastor said one person was saved last year during the revival, and he expects the Lord do work in people’s hearts again this year. The church also served breakfast and an evening meal daily during the rally. Bruton said about 45-50 people showed up for each meal. Meanwhile, Hunter and the other chaplains, who had been affectionately dubbed “the yellow bellies” because of their distinctive, bright yellow t-shirts and caps, were making an impression by their presence. One biker said he attended a revival service because he had seen the chaplains walking around the campground. Chaplain Todd White from Woodward also spoke at revival services June 21-22. The chaplains also gave a “Hope for the Highway” New Testament to several bikers with whom they visited. The New testaments, which contain testimonies specifically targeted at bikers, were paid for by Forest Church, the Pott-Lincoln Association and Bettis’ office. The chaplains, many of whom ministered in New Orleans during Mardi Gras, used the Sparks America rally as a “tune-up” for the nationally-known Sturgis Motorcycle Rally, which will they will attend Aug. 6-12 in Sturgis, S.D.